Yes, its an Astra. That was the catchy tag line that Vauxhall chose to launch this, the 7th generation of the breed. Often marketing strategies can be hard to decipher, but on this occasion the message is clear, and surprisingly frank; it is a tacit acceptance that the Astra has never been that convincing despite selling in healthy numbers. So is there substance behind the assertion that the Astra has caught up? There has been clear progress made not least on the engineering front where a whopping 190 kg has been dispatched and a new generation of engines has been ensconced. 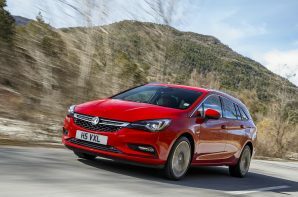 Despite the dramatic weight loss there is also a greater sense of solidity, partly down to the styling being more chiselled and partly due to it achieving the highest torsional rigidity of any Astra on record. Under the bonnet is a new 3 cylinder turbo petrol. Vauxhall was late to the three-pot story, but it has produced a good unit which is on the money for power, torque and official fuel economy. In combination with the restrained kerb weight, it provides enough grunt to accomplish everyday tasks without driving flat out, but we found it used more fuel than rivals when we tested it in the hatch. Talking of driving, the Astra is competent but still fails to provide any incentive to push on. The steering is vague and the brakes are hard to modulate whilst the ultimate chassis balance tends towards safe understeer. Driving also gives you time to consider the interior which all feels solid enough but is a bit dull and doesn’t feel as upmarket as it could. However the Astra does have some strong points, including a sensible boot (540 litres sets up / 1630 litres seats down) a sensible price, and through the OnStar service 4G wireless hotspot capability. What it doesn’t offer is a sparkling drive which is why we would recommend driving a few rivals before signing on the dotted line.